Physics professor Paul Kwiat (left) and his team of undergraduate students: Shaurya Anuj Singhal, Ben Fields, Jack Bernard and Julia Spina. Professor Schrodenberg has gone missing, along with her research into quantum encryption, and four government agents have disappeared while searching her office. Nuclear codes are at risk, warns a dour agent in mirrored sunglasses as he orders a rescue mission via video message. When the video ends, Amelia Launspach, a student in engineering physics at the University of Illinois, surveys the group embarking on the mission. The junior from LaGrange, Illinois, collects waivers and unlocks the door to the professor’s office for the investigators to enter. Then she closes the door and locks them in. Launspach is a guide at LabEscape, Urbana’s newest “escape room,” an outreach initiative of the University of Illinois department of physics. A group of people is given an hour to solve a series of puzzles that will unlock the mystery of Professor Schrodenberg’s disappearance and provide an exit from her locked-down office. The twist? The puzzles are based on physics concepts. The storyline revolves around the disappearance of the fictional Professor Alberta Schrodenberg, the name an amalgam of famous physicists Albert Einstein, Erwin Schrodinger and Werner Heisenberg. Played by real-life Illinois physics professor Nadya Mason, Schrodenberg appears in video messages to give clues as participants unlock puzzles. The hardest part about designing the puzzles and clues was figuring out what would be intuitive for a person with little or no physics education, said Spina, who is double majoring in engineering physics and applied mathematics. 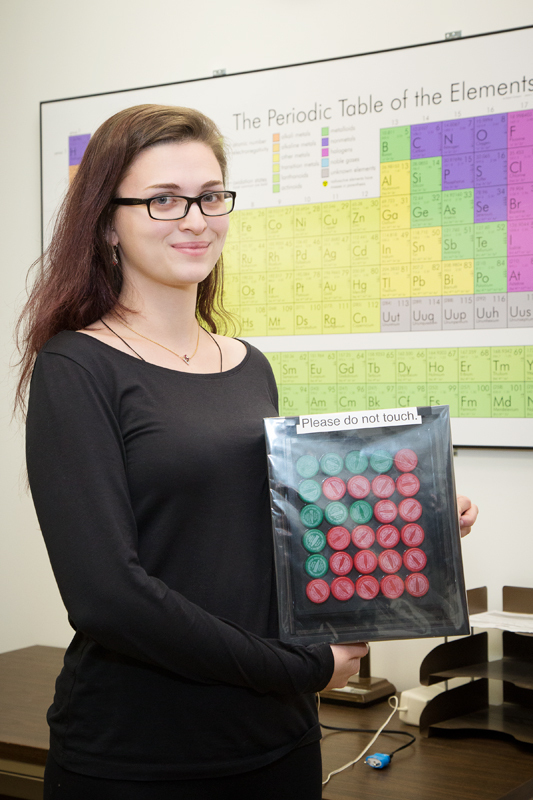 Physics student Julia Spina helped design and build many of the puzzles, which illustrate physics concepts. “For the most part, we started with the physical concepts and then found a good way to display those concepts with a puzzle. How can we teach people about polarization or light spectra?” she said. Many of the puzzles, as well as activities in the lobby and artwork throughout the LabEscape space, were carefully crafted to create a space that is not only educational and interactive, but visually stunning. “We had three main goals in creating a physics-based escape room: to show people that science can be fun, that it is relevant and accessible, and that it can be beautiful,” Kwiat said. The students built the puzzles and devices from scratch, gaining hands-on experience with materials and techniques that they may not have otherwise encountered as undergraduates. They watched beta testers try each of the puzzles, so they could see the different approaches people took to solving them and adjust the puzzles when necessary. If the puzzles in the escape room become too challenging for a group, the student guides can provide help from outside the room. “I watch them on security cameras, and I’m able to send them messages to a text terminal in the room. They can look at the camera and salute to me, and then I’ll know they’re stuck and can send them a hint,” Launspach said. After completing the room or running out of time, the participants are joined by their student guide for a debriefing and to ask questions about anything in the room. 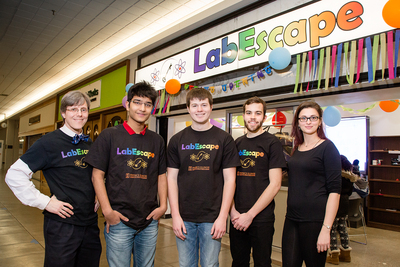 LabEscape has hosted corporate teambuilding events, student groups from seventh grade through graduate school, and even a birthday party. Sessions can be booked at http://labescape.org/. The admission fees of $15 for students and $20 for nonstudents support the overhead cost of running LabEscape. A new scenario and set of puzzles are being planned for future semesters, so that groups can visit again and learn different concepts.